HI Guys, been in the videogame repair business for 15 years, but never figured out how to repair the Model 1 Super Nintendo that has AV Problems, so I just kept storing these up, so I am fed up with all these defects here, and need help to figure out whats wrong with them! and no, its not cap replacement, Ive done enough cap replacements on my snes to know this is not the problem!. Ok so in a nutshell, all of them are Generation 1 SNES Consoles, the one with the removable soundboard, all of them work fine with RF Hookups but if you use an AV Cable a lot of jitter can be seen (And you can hear the sound ok) So I guess the snes has 2 video controller chips, of some kind, that outputs the video one thru RF and the other thru RCA. I need to know which chip is it! and its damaged on all of my 50+ consoles, (95% of generation 1 snes that i get i trades have this damn problem). Composite video pin on the multi-out is dirty or corroded. Something is bad in the circled area of the schematic. Check your grounds as well. The composite signal coming from the video encoder is bad, but the RF modulator is able to correct it. This is technically for a revision 2 board, but the idea is the same. Click for bigness. ⃟ Mario says "... if you do drugs, you go to hell before you die." 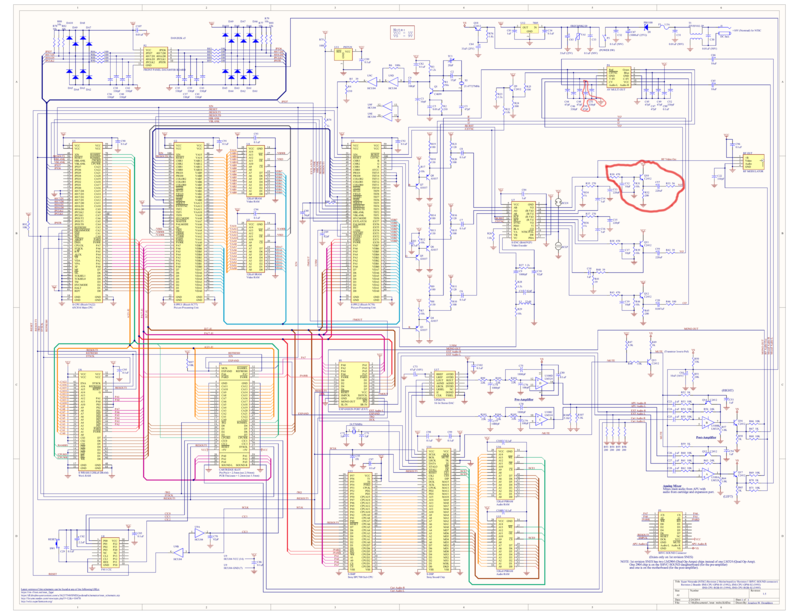 Given the description that full cap replacement doesn't fix the problem, I'm leaning towards the video encoder, in this schematic's case the BA6592F. That or the Q10 transistor. if at all possible I would tap into the 6592 directly and see if you get any thing there, if not then you'll rule out trying to find something between there and the plug. Remember that his trouble is with composite video. Since RF works, we know that the video encoder is outputting a composite signal. I would expect the problem to be in the video amplifier, most likely the transistor as suggested by Bratwurst. Last edited by RP2A03; 05-20-2017 at 10:44 PM. For the component mod on first gen snes use this. I have used it before and it worked great. What you are pulling off the chip isn't red, green, and blue. You are getting luma (the black and white part) which goes to the green jack, blue and luma difference which goes to the blue jack, and red and luma difference which goes to the red jack. 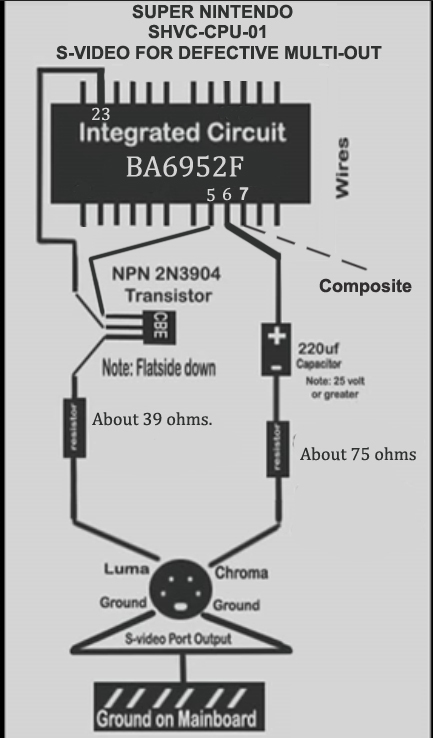 For the record, you are not supposed to pull luma from the encoder chip, you are supposed to take it after it has passed through the amplifier. With that said, this doesn't help you fix your problem withcomposite video. What concerns me more is the apparently weak R - Y and B - Y signals. Measure the DC voltage on pins 1 and 24. They should both be about 3 volts. little late back to this party but I tapped into all 3 on the board it self and bypassed the a/v out on the back of the system. I got color, was slightly washed but not nearly as bad as your seeing here. Basically, there is an easy way to bypass the entire multi-out, including the on-board video amp on consoles that behave this way. Only seen this behaviour on launch consoles that had the first revision of PPU2, but that could be a coincidence. The Official "My Rock Band Hardware Works Fine" Thread.